Thank you for giving to H.O.O.V.E.S. For approximately eight million veterans returning home from duty, one of their biggest battles is still ahead of them: post-traumatic stress disorder (PTSD). 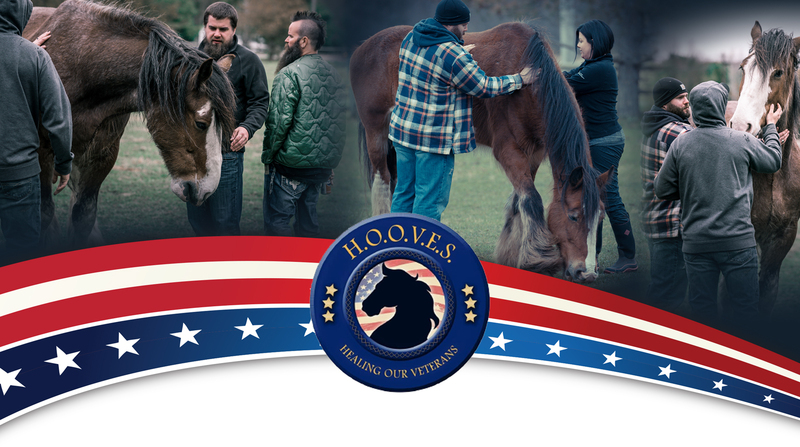 Healing of Our Veterans Equine Services (H.O.O.V.E.S.) is a life-saving program whose mission is to help veterans living with PTSD heal, regain control and return to the life they once fought to protect. The unique program partners veterans with horses in customized exercises designed to accomplish specific tasks. As a person interacts with them, the horse reads their body language and acts as a mirror, reflecting the feelings back. This unique approach allows participants to come to their own realizations and promotes real-time learning and healing. Veterans gain confidence while learning to adapt and improvise, helping them to break down emotional barriers, build connections, ignite self-awareness and develop new coping skills. Your contributions will allow the program to remain absolutely free to veterans and their families. Your generosity will give purpose and provide care to the rescued horses, whose healing bond with participants is the cornerstone of the program.